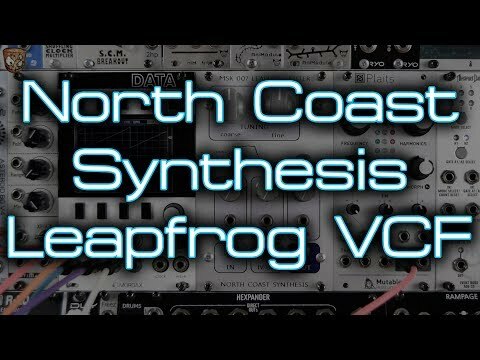 MSK 007 Leapfrog VCF - North Coast Synthesis Ltd. There are hundreds of analog synthesizer VCFs, but only a few core designs. 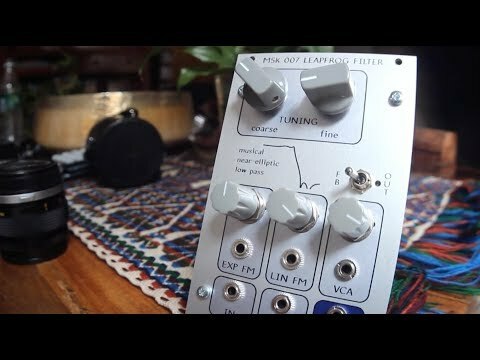 You've got your Moog transistor ladder and imitators that use diodes or other substitutes; you've got your two-pole state variable filter, maybe cascaded to get additional poles; and that's about it. Your grandmother was making electronic music with these designs in the 1960s, and not much has happened since. There are a few more options available in digital and semi-digital (such as switched-capacitor) architectures, but most analog designers have given up trying to create really new filters. Instead, they compete on how well they can imitate or clone specific "vintage" filters. The North Coast Synthesis MSK 007 Leapfrog is new and different, with a sound all its own. The fifth-order "leapfrog" core topology, with five integrators and multiple feedback loops, originates in scientific work more recent than the 1960s and as far as we know never before available in a modular synth VCF. The near-elliptic response curve has an extremely sharp cutoff, with ripple in the passband and nulls in the stopband at frequencies chosen to be musically relevant. Sweep the cutoff and hear each harmonic pop into existence and wobble around before the next one arrives. Choose a timbre, and the temperature compensated volt per octave tracking will keep it consistent across the frequency range. Change it up with exponential and linear frequency modulation. There's even a built-in VCA, because you can never have too many VCAs. The MSK 007 is available as a pre-built 16HP Eurorack module or a DIY kit. It's the perfect gift for Grandma or any other electronic musician in your life. No compromises on build quality: real aluminum panel, not PCB material, with colour printing; panel screwed solidly to both the PCBs and the pots and jacks, for maximum ruggedness; nickel and gold plating on the circuit boards; smooth-touch conductive plastic panel potentiometers rated for one million operations; polystyrene integrator capacitors; close-tolerance metal film fixed resistors; multiturn trimmers. 16HP Eurorack synthesizer module, 58mm deep including mated power cable. Maximum current requirements in normal use: 70mA +12V, 65mA -12V. Reverse-connection protected. Build difficulty: intermediate to advanced, because of the number of parts and adjustment steps. All through-hole. Multimeter and dual-trace digital oscilloscope are recommended for adjustment, with other options possible. Click titles for patch notes; and visit our audio server for more tracks made with the MSK 007.